As a family of six, we do a lot of laundry around here. At any given moment I’ve got a load in the washer, or at least I should if I don’t want to get behind. And the cost of all the laundry detergent starts to add up, especially the dye-free, fragrance-free, most scary-chemical-free brands that I favor. So a few years ago I started to make my own. It sounds hippie and a bit crazy, but really, it takes very little time and saves so much money. Plus, it’s free of the dyes, fragrances and chemicals that I want to avoid. Mix all ingredients together and store in air-tight container. Use 1-2 tablespoons per load, adding to washing machine per your machine’s instructions. You may have to use more or less depending on your water, washing machine, dirty clothes, etc. I can’t find my cost analysis (yes, I made a spreadsheet. I’m a geek like that) but believe me when I say it saves money. A lot of money. I make a big batch (usually 4x the recipe) and keep it in an air-tight container in the garage…..I keep a smaller container of it with a measuring spoon in the laundry room. It lasts me 4-6 months, depending on how much laundry I have in that time frame. I tend to use more in the winter than summer, though now that we’re the new house with lots more outside chores and activities, that may change. One more thing, I find grating the bars of soap a bit tedious, though it still only takes maybe 10 minutes for 4 bars. I used to use my box grater, but my knuckles were taking a beating with that method. 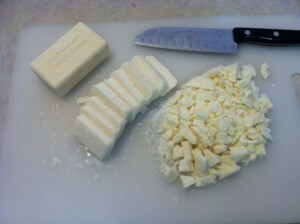 Now I slice the bars into several slices, then give the slices a rough chop. Then I throw it all in my food processor with the chopping blade to make a finer powder. 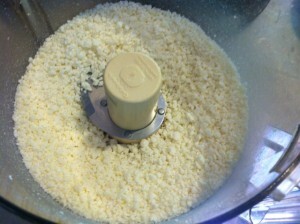 My food processor best chops about 2 bars at a time without gumming up too much or overheating. Short pulses are better than a continuous run. If you search online for laundry detergent recipes you will find hundreds of variations….this is the one that works for me. Do you make your own? Share your recipe in the comments.